Unfortunately I now have to add 'Castries' to the long list of thinks to worry about. More specifically the insane people that live there. Now why would I say this? What justification do I have? Well let me explain myself. So I'm walking down the flipping High Street, as in the busiest street in the city, and I see THIS. Two HUGE boxes thrown onto the sidewalk, full and spewing over with RAW CHICKEN SKIN. What has this sick world we live in come to! So, so, disappointed. I was already very weary about going to Castries, now I have to treat it as if it were a leper colony. Above all that, it stayed there all day in the blistering sun, by then its pungent putridity permeated the entire street (Ahh, sweet alliteration). To the mentally unstable person who did this, I hope you're the first person who is mutated when the rats start spreading the zombie chicken skin plague that you have brought upon us!!! And it's not just the chicken skin, there's a lot of sick and nasty people that just urinate all over the place, on every street and every corner. Garbage everywhere. Honestly what has Castries come to. The most sickening thing is that it stems right from the big cooperations themselves! 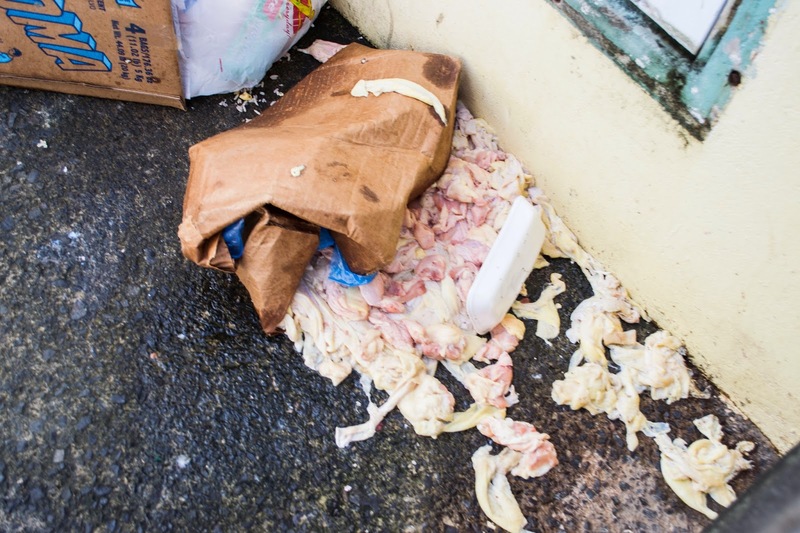 I've personally seen a fast food store that specialises in fried chicken, and who's acronmy might be close to KCF, defrosting a box of chicken outside in the filthy and grotty alleyway floor behind the store. No? Too drastic? Mhmmmm, maybe. Or we could ship all the crazies off to Rat Island? Which coincidently used to be a leper colony. Hope you enjoyed this blog post because I sure didn't, not too sure where I was going with it. I think I just needed to vent. Please share, like and tweet it, and tell as many people about it as you can and I'll love you forever! :) Sign up to get an email subscription as to when a new article comes out, which will be next week when talk about a car accident that happened on our hill, and how terrible 911 is! Comment down below any experiences that you have had with stalkers!